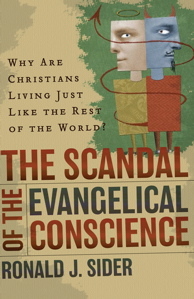 In Ron Sider’s great book entitled Scandal of the Evangelical Conscience: Why Are Christians Living Just Like the Rest of the World? there are some incredible statistics. The two most telling (for me at least) are those related to divorce and those related to tithing. According to the sources Sider cites, only around 6% of Christians tithe (give 10% of their income to the church). If you are saying to yourself, “But the New Testament doesn’t command us to give 10%, that’s an Old Testament law,” then you’re missing the point. As Christians, we should give liberally and cheerfully. Personally, I feel as though something around 10% should be a minimum, but that’s another story. What does this point to according to Sider? Rampant materialism and self-centeredness. We care more about having stuff and about taking care of ourselves than we do about other people and about the spread of the gospel. And I know this is true because if you’re like me, even as I type this, I am justifying in 100 different ways why I don’t give more than 10% of my income to the church and other gospel-oriented organizations. No wonder people like Jesus but not the church. Our money is certainly not where our mouth is. Secondly, the divorce rate is no different among Christians than among non-Christians. In fact, of those Christians who divorced 90% were believers when they divorced (the other 10% got divorced before becoming a Christian). Why? As Sider’s subtitle suggests, Christians are more interested in living just like the rest of the world, with perhaps a little more security and ticket to heaven thrown in for good measure. We aren’t interested in “turning the other cheek.” We think Christianity should make us happy and when it doesn’t we get to take matters into our own hands. Of course, many people suggest that statistics are unreliable, but I don’t think anyone is surprised by these statistics. They aren’t saying anything that we haven’t already seen over the years. But the question remains, what do we do about? Or more directly, what do I do about it?